Baugh's Blog: Book Review: Charles Dickens 10 - "Bleak House"
﻿There was a one-year hiatus between the completion of David Copperfield (November, 1850) and the time when Charles Dickens finally set about writing his next novel, Bleak House. Actually, he had come up with the general idea for the new story in February, 1851 – only three months after the previous book – but, in addition to the usual round of family obligations and social events that kept him so very busy, he was further distracted for most of 1851 from starting the new novel by a series of difficult and traumatic events. The most upsetting of these events were two deaths in the family. In March, Dickens’s father, John, became dangerously ill with a urological problem – probably caused by bladder stones. An operation was done – without anaesthetic – to remove the stones. Dickens arrived on the scene soon after the horrendous procedure was completed. He described the room where his father lay to his wife, Catherine, as “a slaughter house of blood”. John Dickens rallied briefly, but then suffered a steady decline, dying on March 31. Charles was very distressed. He was up three nights in a row, spending most of the time walking around the streets of London thinking about the long and often difficult relationship he had had with his father. He behaved with great tenderness to his mother, Elizabeth, telling her that she could rely entirely on him for the future. And – yet again – he paid off all of his father’s debts. As if that wasn’t enough to deal with, only two weeks later – April 14, 1851 – his daughter Dora Annie died – aged only nine months – after a brief illness. She was the ninth of the Dickens’s ten children. The lease on Dickens’s house at Devonshire Terrace expired in 1851. He began looking for a new place in north London – concentrating his search in the Highgate area and around Regents Park. Eventually he found a large, 18-room house – with garden – in Tavistock Square, called Tavistock House. 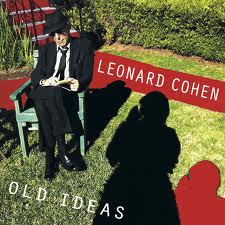 In July he signed a fifty-year lease for the place – paying £1,500 – intending it to be his final home. It wasn’t in very good condition, so Dickens ordered a whole series of renovations, in order to fix up the house to his liking. These repairs, which he supervised closely, took several months, and Dickens decided to hold off serious work on the new novel until the late autumn, or early winter, when the changes were complete and the family was settled in. Then, Dickens’s wife became ill with a chronic nervous condition. She suffered migraine-type headaches. Charles described her symptoms as “a tendency of blood to the head, and alarming confusion and nervousness at times.” Dickens was solicitous of Catherine’s health. He suggested a “water cure” at Malvern – a popular spa in the nineteenth-century, because of the beneficial effects noted from the water coming out of the Malvern Hills. He took her there – Malvern sits near the border of Herefordshire and Worcestershire – for an extended treatment. 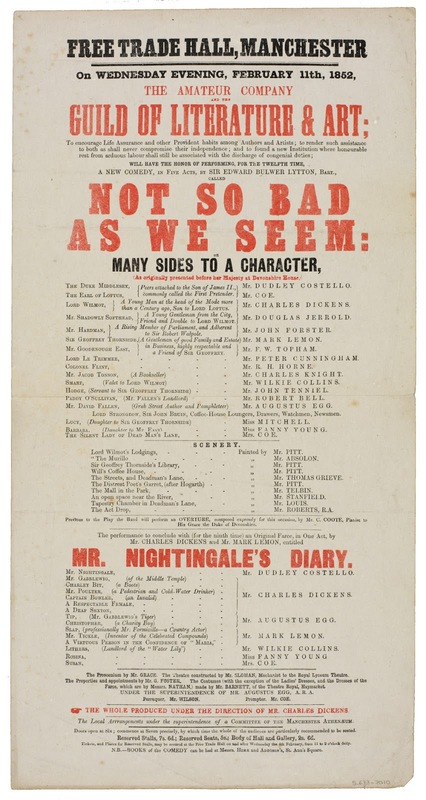 Throughout the year Dickens was also deeply involved in more amateur theatricals. As before, he recruited and organised his own troupe – mostly friends and family, but he also engaged the help of a few professional actors this time to fill out the cast. He produced and directed the work, starred in it, organised scenery, costumes, props, and so on. The first production of the year was a royal command performance on May 16 – in front of Queen Victoria and Prince Albert – of the comedy Not So Bad as We Seem, written by his friend Edward Bulwer Lytton. The Queen was amused: “All acted on the whole well,” she wrote in her diary, “Dickens, the celebrated author, admirably …”. The proceeds from these performances were donated to the Guild of Literature and Art, a charity established by Dickens, John Forster and Bulwer Lytton to assist writers in financial difficulties. Later in the year, Dickens took his troupe around the country for half-a-dozen, or so, more performances. 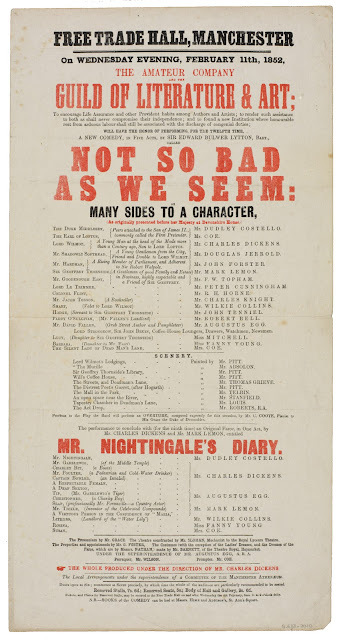 These performances included a production of a new farce written by Dickens and playwright Mark Lemon called Mr. Nightingale’s Diary. 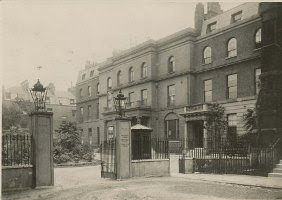 Finally, in mid-November of 1851, Dickens and Family were established in the new house in Tavistock Square, and Dickens began work on Bleak House immediately. 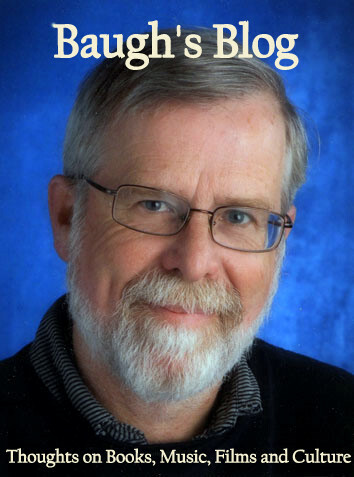 He told his publisher, Evans, that he would have the first monthly issue of a new novel ready for publication by March. The study Dickens set up was in a large room next to the dining room. The two rooms were separated by sliding doors. When he was busy writing, he would open the doors and walk up and down the two rooms – the entire length of the house. He had the opening chapters finished in December. ﻿Once he started serious work on Bleak House, Dickens – as usual – became completely absorbed in its imaginary world. He cut back dramatically on his social engagements, deciding that two public dinners per month were his limit. He was in his study now for four hours a day writing the book, from ten in the morning until two in the afternoon. 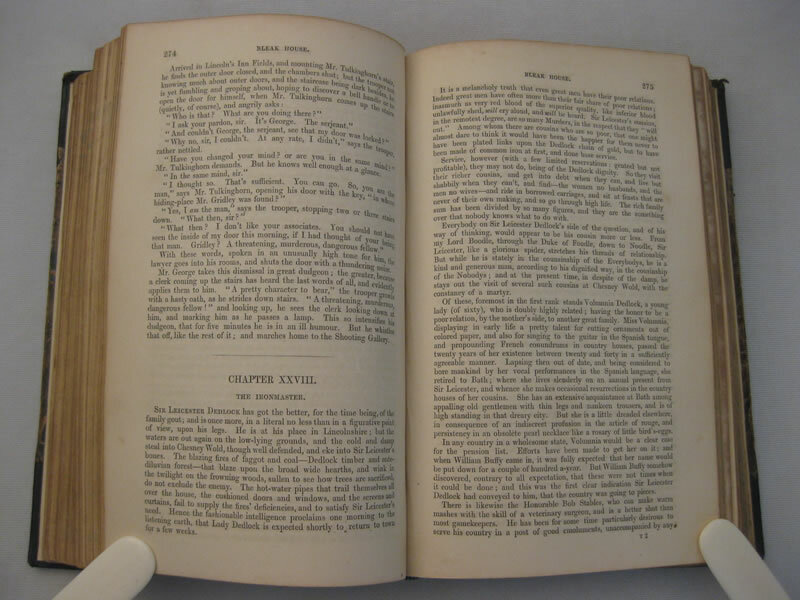 Once the publication of the book got started, Dickens stayed just one month ahead of each instalment. He set himself the goal of finishing each month’s issue by the twentieth day of the month. That gave him about a week to go through and correct the proofs. He was so firmly set in his writing habits, now, that he could deal with a change of accommodation easily, and still meet his daily quota of words. He had no other choice, really; he had to adapt himself and work quickly, because family obligations had him moving about a lot, and business demands often disrupted his daily writing regimen. During the writing of Bleak House, Dickens was moving between London, Folkestone, Dover and, now, even Boulogne in France. But he kept writing. And once he was into his groove, he did not seem to agonise over its contents. 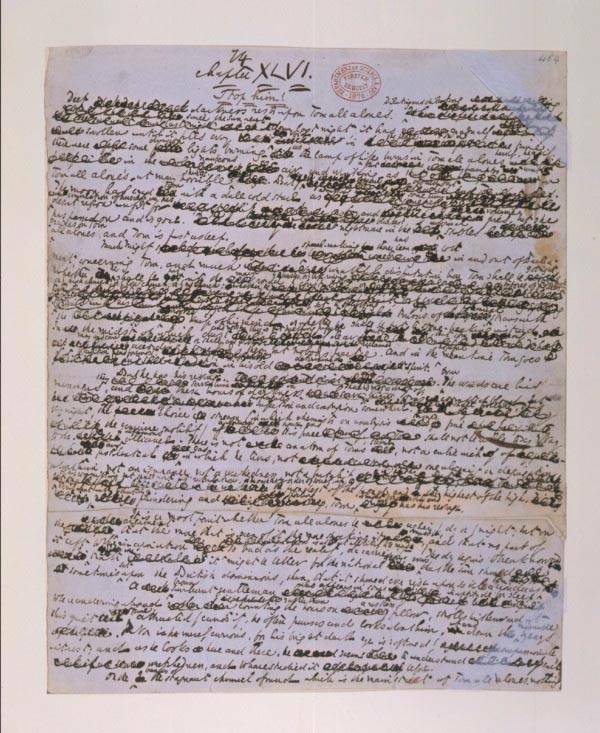 There are very few mentions about the process of writing of the novel in his correspondence, which is unusual for him. 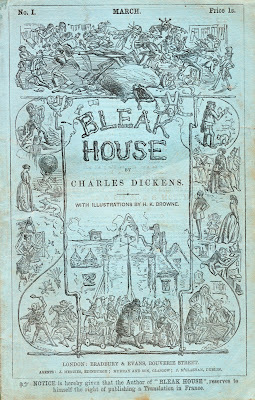 Bleak House, Dickens’s ninth novel, was published by Bradbury & Evans in the usual monthly instalments between March, 1852 and September, 1853. Each issue consisted normally of three chapters – some of them contained four – and cost a shilling. The twentieth, and final, instalment was the usual double issue, priced at two shillings. Each magazine issue of Bleak House came with bluish-green wrappers, instead of the familiar bright green; and this would become the new routine, until Our Mutual Friend, when the publishers returned to the bright-green wrappers. Following the usual lay-out format, the monthly instalments had 32 pages of text and two illustrations by Hablot Knight Browne (‘Phiz’). One of the interesting features of the illustrations that Phiz did for this novel, was an innovative technique he introduced to heighten the sombre mood of the story. For many of the engravings used to illustrate scenes set in the London slums, he created so-called “dark plates” – he machine-ruled the entire engraving plate with very thin parallel lines. The effect was to create a darker tone – a clever and appropriate technique for this brooding story. ﻿Despite the often grim story and sombre mood of the new book – his friend and confidant, John Forster called it “too real to be pleasant” – Bleak House, surprisingly, turned out to be much more successful than its sunny and entertaining predecessor, David Copperfield. The previous book had sold just over 20,000 copies per month. The new novel was selling between 34,000 and 43,000 copies for each issue. Go figure! In total, Dickens was to receive about £11,000 for his latest creation. As always, Dickens’s book deals with topical concerns: specifically, the worst aspects of the English legal system, and the physical sickness of London (caused by its slum dwellings, festering sewage, and toxic water); but, generally, the sense that the whole of society was undermined by a corrupt and unresponsive system of government. The deformations and grotesqueries of individuals reflect the warped condition of society-at-large – the System. The central issue pushing the plot of Bleak House is a long-standing case of litigation – Jarndyce vs. Jarndyce – making its unending way through the courts of Chancery. It involves a testator who made several, contradictory wills. At that time, the Court of Chancery in London, was a court of equity designed to mitigate the rigours of common law – allowing judges the leeway to apply justice in accordance with natural law. The court was under the nominal control of the Lord Chancellor. The extended backlog of cases was legendary. In the spring and summer of 1851 – when Dickens was pondering the theme and plot of his new book – there were reports in The Times newspaper about the incredible delays which were happening regularly with suits in Chancery. The delays were believed to be caused by corruption of the entire system – and that was Dickens’s own view. As he puts it tartly in Bleak House: “The one great principle of English law is to make business for itself.” Some critics thought the portrayal of the Chancery court in his book was too harsh and exaggerated, but Dickens had personal experience to draw on: he had worked as a law clerk in his youth, and, more recently, he had been a litigant himself in Chancery, seeking to enforce the copyrights that existed on his earlier books. 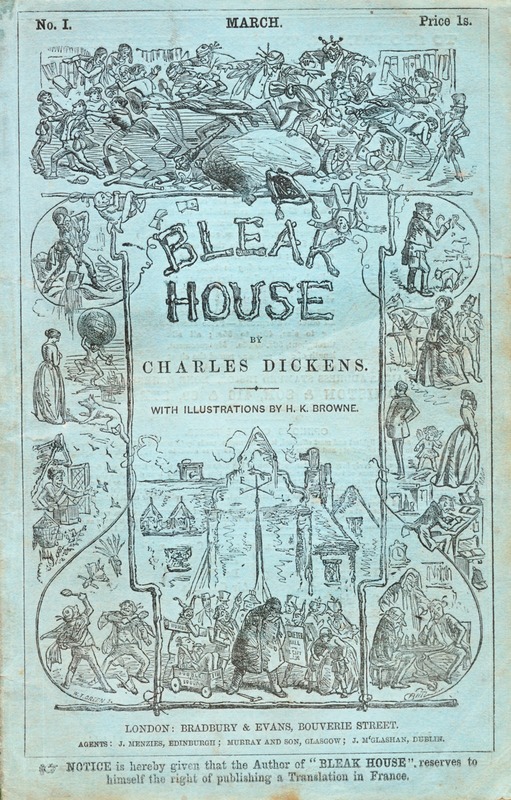 Bleak House marks a new beginning in Dickens’s literary output. He was never one to stand still and repeat his successes; he would build upon what he had learned from the writing of his previous novels, and then look for new ways to advance his art. In Bleak House, Dickens sought to meld the introverted psychology of David Copperfield with the social analysis and satire of Dombey and Son. He achieved this primarily through the innovative technique of alternating between two narrative points-of-view in telling his story: there is the familiar, omniscient third-person narrator; but there is also the ardent, humble, first-person perspective provided by Esther Summerson. The omniscient narrator tells the story in the present tense. Esther is narrating about events long past – we learn near the end of the book that she is looking back from a seven-year distance at most of the events she is describing. These very different voices balance the narrative evenly: 34 chapters for the omniscient narrator, and 33 for Esther. This was a really daring strategy for Dickens to use, because he usually had difficulty creating interesting and compelling female characters. They either veer towards the irritating or grotesque (Sairey Gamp in Martin Chuzzlewit, for example), or they bore us as mere colourless embodiments of Dickens’s notion of the feminine ideal – compliant, self-abnegating and long-suffering (Agnes Wickfield in David Copperfield). And there certainly are tendencies in Esther’s point-of-view towards the bland and predictable. 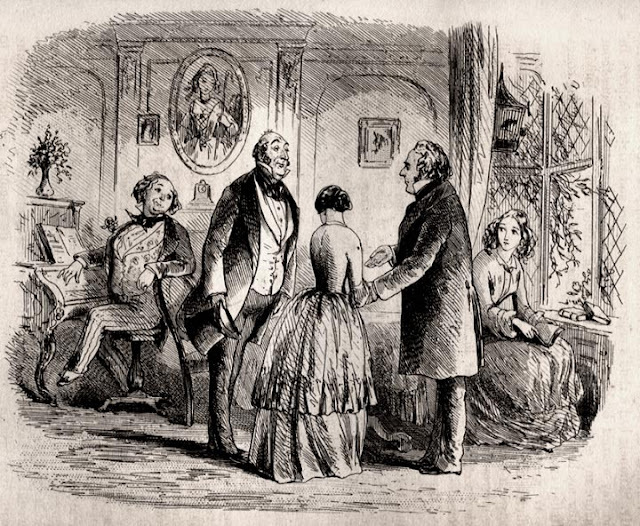 It is inevitable, given that she is a typical model of the “good” character that Dickens usually favoured – full of the Christian virtues of forgiveness, gentleness and passivity. Nice but not very dramatic. But Dickens seems aware of the danger, and he does show growth and development in her response to life – often surprising us, for example, with her astute and critical judgments of characters and situations (especially so, given her narrow and cloistered experience of life). Nonetheless, many readers were still annoyed by Esther’s always-cheerful, self-denying tone – Charlotte Bronte, for example, creator of a much more real narrative voice in Jane Eyre, found Esther an overly-meek and cloying figure. In his Introduction to the 1907 Everyman’s Library edition of the novel, G. K. Chesterton observes that Bleak House “is not certainly Charles Dickens’s best book; but perhaps it’s his best novel.” He argues that the author was now a mature writer and this latest novel of his was the best he had ever constructed. 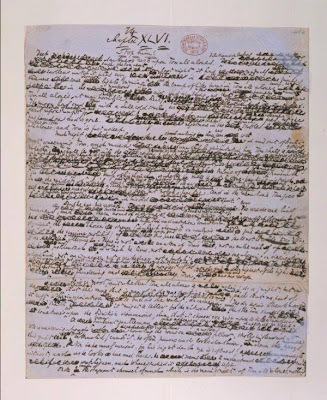 Critics often found fault with the construction of Dickens’s books – usually forgetting, perhaps, that they were published in monthly instalments, rather than completed as a whole and then revised and edited before publication. “Of all his books,” Chesterton adds, “it should most please the modern aesthetic critic.” An astute comment – if you peruse the reading lists of university courses on Victorian literature, you will come to the conclusion that Chesterton’s assessment seems the consensus view in today’s academic circles. The leap forward from David Copperfield, Chesterton argues, is towards art – towards a new concern for the style and method of story-telling. Most of Dickens’s previous novels had been rambling, picaresque tales. 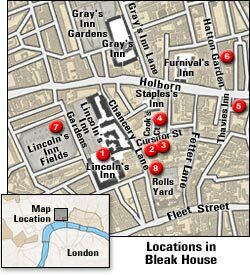 Bleak House did not share this character of being a string of incidents; it was a cycle of incidents circling around a few symbolic places: Chesney Wold in Lincolnshire, Bleak House in London, and a cluster of residences located near the courts of Chancery. 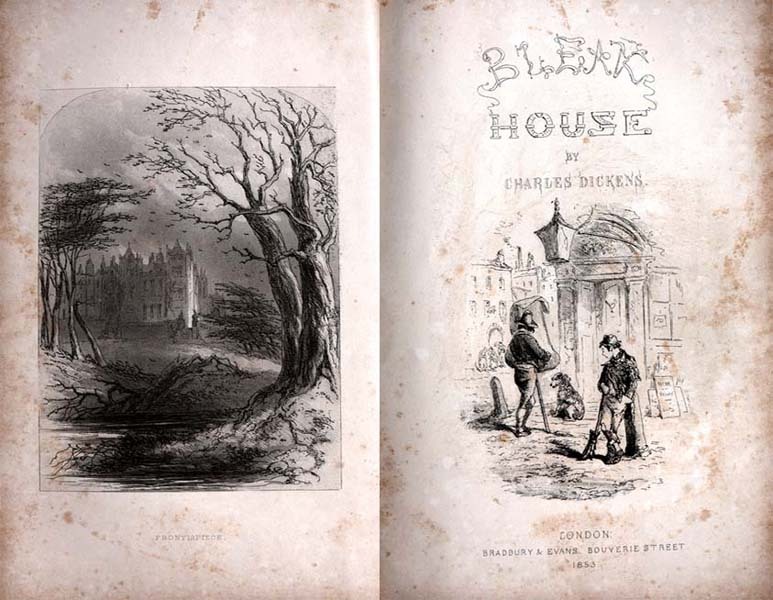 Bleak House has sometimes been referred to as the first of Dickens’s “London Trilogy, three complex and sprawling novels of Dickens’s late period – the other two being Little Dorrit and Our Mutual Friend. Each, in its way, addresses the seamier side of early and mid-Victorian London – the decrepit and filthy slum housing, the awful sanitation (leading to epidemics of disease), and the inadequacies of the legal system. Each book has its dominant symbol. 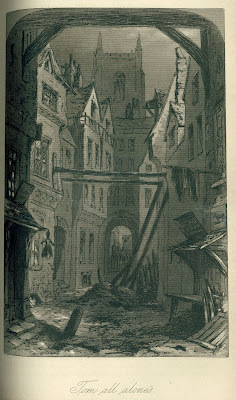 In Our Mutual Friend it’s the dust-heap (garbage pile); in Little Dorrit it’s the prison; and in Bleak House it is the fog – introduced on the book’s very first page as a permeating condition of the entire capital. When you read the description, you realise Dickens is really talking about smog – but the concept had not been invented yet. But fog is just a symbol of the city’s malaise. The pollution is more serious than that – serving as a breeding ground for epidemics of diseases like smallpox. Characters in the novel get sick; some are paralysed; some are sterile; many are wounded and defaced – physically and emotionally. There are survivors – like Esther, who barely recovers from her brush with smallpox, but many of the characters are left dead or damaged. Bleak House is a complex novel. The narrative, as we’ve seen, is split between two very different perspectives. The language is dense, allusive and poetic – full of sentence fragments, symbols and strange allusions. It’s not an easy book to read. Dickens’s third-person narrator is not the usual, breezy stand-in for the author himself; he is a more aloof figure than usual. There is a large crowd of minor characters populating the book; and as we move through the story, it’s often tricky keeping track of all its strands and the various relations amongst them. Who knows whom? And who knows who has done what to whom? It’s especially difficult separating the various levels of secret knowledge amongst those characters centred on Chancery Lane. It also takes a long time for the story to gain any momentum – the first hundred pages or so drift by and you wonder where the story might be going. To me, this was definitely a new style for Dickens: much less obvious and didactic, much more muted and restrained. But there are some familiar narrative strategies at work here. The “turning idea” of the novel is the real identity of one of its central figures – Esther Summerson. This mystery drives the plot forward and pulls together many of the strands involving so many of the minor characters. In this sense, Bleak House is a mystery story, and Dickens brings into its midst Mr. Inspector Bucket (modelled on his friend Chief Inspector Field), a clever but down-to-earth, tenacious police officer. In doing so, he was writing one of the first ‘detective stories’. Near the climax of the mystery he sets up three probable suspects as the perpetrator of a murder. And does a good job telegraphing guilt towards the wrong person. Despite Dickens’s focus on the inadequacies and corruption of the system, he also shows, as usual, how moral failings affect individual lives. In Martin Chuzzlewit it was selfishness that underlay the problems of the Chuzzlewit clan. In Dombey and Son it was pride that brought down the Dombey family. And here, in Bleak House, it is irresponsibility and neglect that taint many of its character’s lives. Harold Skimpole, for example, is an alarmingly irresponsible and fickle figure. His carefree attitude to the money he spends – but does not have – is presented in a rather light and humorous fashion early on. But as he continues to sponge off other people, and blithely justifies himself to the very people he is exploiting, he quickly turns into a loathsome character. Strangely, Skimpole was based on one of Dickens’s own literary friends – Leigh Hunt – whom he had known for over ten years. 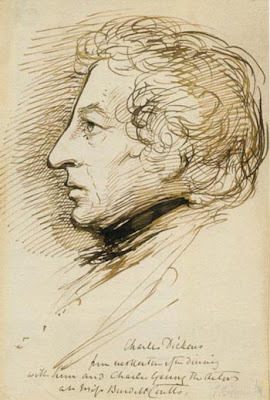 Hunt’s friends and family recognised the source of the Skimpole character very early in the run of the book and asked Dickens to tone down the harshness of the portrait. Dickens refused – he had a superlative characterisation in hand, and had already established it in his book; he could not abandon it now. In fact, the portrait became even more pointed and overdrawn. One of the hazards, I guess of befriending a famous writer! 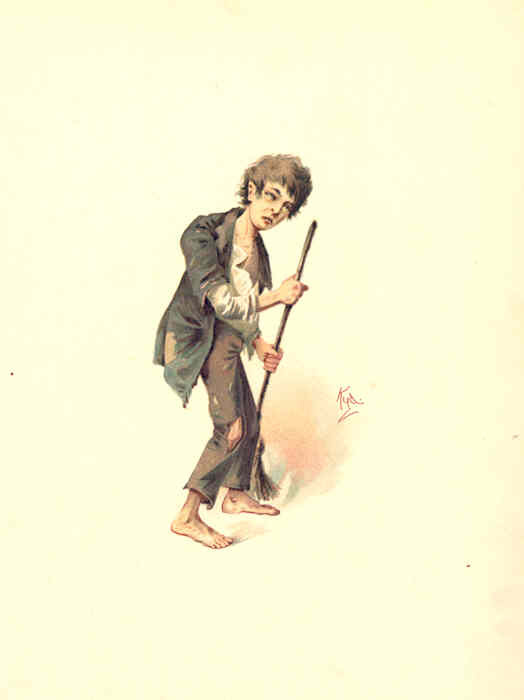 ﻿And a prime example of the many neglected characters in Bleak House is Jo (“Toughey”), the crossing sweeper. He is a homeless orphan boy. When we first meet him in the novel, he is a squatter in the dilapidated ruins of the slum houses in Tom-all-Alone’s. His menial job is to clear a narrow passage through the mud and manure, so ladies and gentlemen could cross the London streets. Jo is an ignorant and solitary character. There is nobody to care for him, until he falls ill with smallpox. And then Esther takes him home to Bleak House – and almost dies because of her compassion. But that’s not the end of Jo’s travails. As with other oppressed children in previous novels – little Paul Dombey, and little Nell – the sentimental Victorian readership took him to their hearts: he became the most popular character in the book. 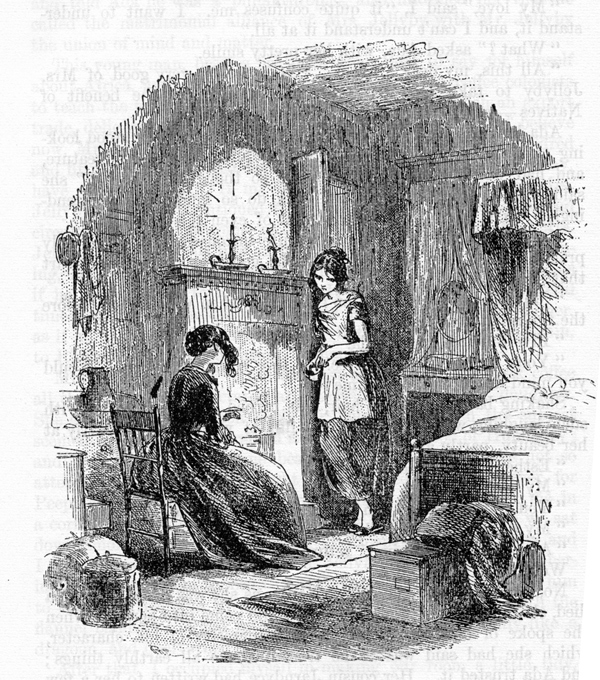 In the previous book, David Copperfield, Dickens had portrayed several interesting female characters. In Bleak House there are a couple of his standard “perfect” feminine types. But he also pens a couple on nasty portraits of female do-gooders. There is the self-righteous Mrs. Jellyby, a “telescopic philanthropist” – another of the irresponsible figures – who neglects her family completely to dirt and disorder, in order to pursue her charitable work for some obscure African tribe. What her abandoned family think, but never utter, is that charity ought to begin at home. And then there is the self-satisfied and arrogant Mrs. Pardiggle, who inflicts her “good works” (really nothing more than moralising) on the poor and drags along her resentful and rebellious children. ﻿﻿But then in the figure of Caroline Jellyby (Caddy), Mrs. Jellyby’s eldest daughter, Dickens creates a wonderfully sympathetic portrait of a desperate young woman – yearning for a meaningful life, but with little apparent prospects. Again, it’s the compassionate Esther who takes this forlorn and abandoned creature and provides her with hope and friendship. And with Richard Carstone (one of the Jarndyce wards), Dickens gives a sympathetic portrayal of an irresponsible young man, who is caught in the web of the Jarndyce vs. Jarndyce law suit – amassing a load of personal debt in the expectation of inheriting a small fortune, once the litigation comes to its eventual conclusion. It does, but it is then revealed that £60,000 has been eaten up by the many long years of legal fees. Bleak House received an ambivalent reception. It sold really well. But critical voices began to murmur their disapproval. The Spectator found Bleak House “dull and wearisome”. The Illustrated London News asked its readers: “What do you think of Bleak House?” It was recognised as something quite different from the author whom people thought they had pinned down. His friend and confidant, the literary critic John Forster, thought it lacked the freedom and freshness of his usual work. Perhaps it did, but from another perspective one might argue that Dickens was taking a more careful and “artistic” (stylish) approach to his prose. Modern critics admire the book – many of them, as we have seen, consider it his very best novel. But they also see it as the beginning of a “dark period” in his attitude and art. For me, Bleak House was an interesting but dense read. It lacks the exuberance and high comedy of many of Dickens’s more enjoyable books. The grim setting and sombre story establish an appropriately “bleak” mood. And the characters are at the service of the story, rather than stand-alone figures created for sheer fun and frivolity. It is a compelling book, once you get into the heart of the story, but it doesn’t have the same excitement and momentum of previous books to drive the reader forward. Perhaps I need to come back later and read it again – its more restrained virtues may yet be revealed. That was a delightful essay, illuminating, an excellent combination of elements, and I agree with your summary of the novel. It was a 'buster' to get through, but I DID care about what happened to the characters, Dickens ambushed me successfully from time to time, and when... something happened... it did, at long intervals, I wanted to know how it turned out.